See also Leigh Volunteer Fire Brigade and Leigh Volunteer Fire Brigade 1882-1948. 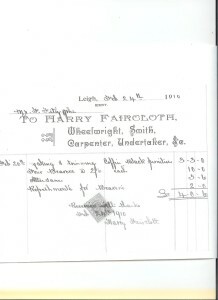 At his funeral in January 1929 Harry Faircloth was accorded a Fireman’s funeral. The funeral took place on Monday afternoon – 7 January 1929 – at Leigh Church, the Rev. F L W Sealy officiated. 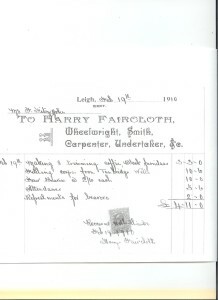 The Faircloth name had been associated with Leigh ‘for some 120 years’ according to his obituary in the Courier – so back to the beginning of the 19th century. Harry’s manner was described as pleasing by his many friends and he was held in high esteem by all who met him. 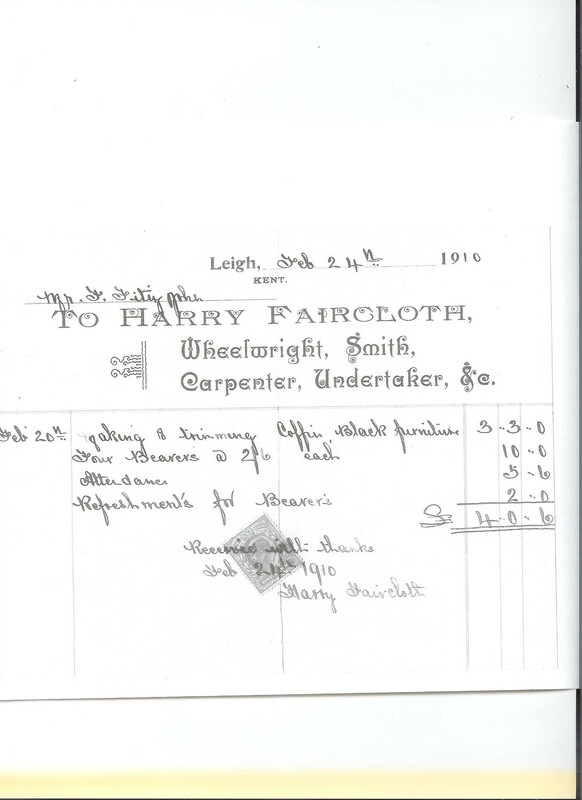 Harry was born at Marlpit Corner, Penshurst in 1856 and as a young man went to Wouldham to learn the business of a wheelwright and therefore followed in the steps of his father, William. 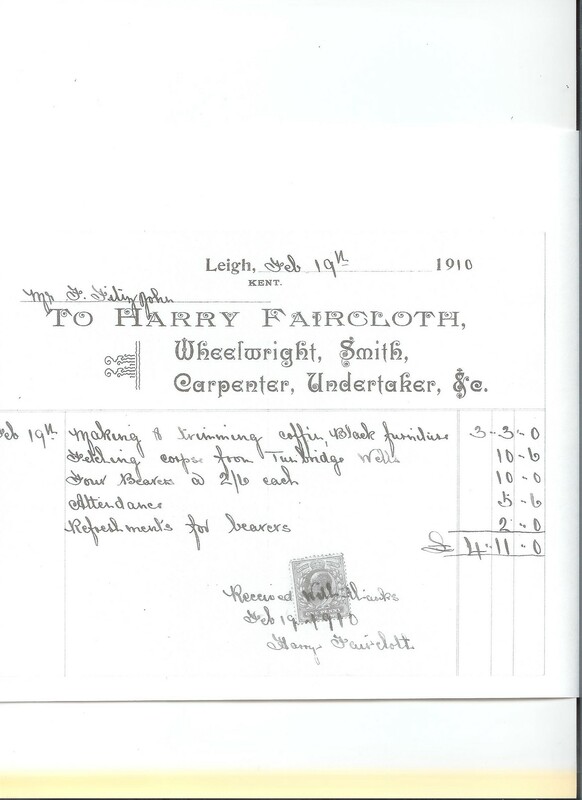 He came to Leigh in about 1880 and became the village wheelwright, carpenter and undertaker up to the time of his death. 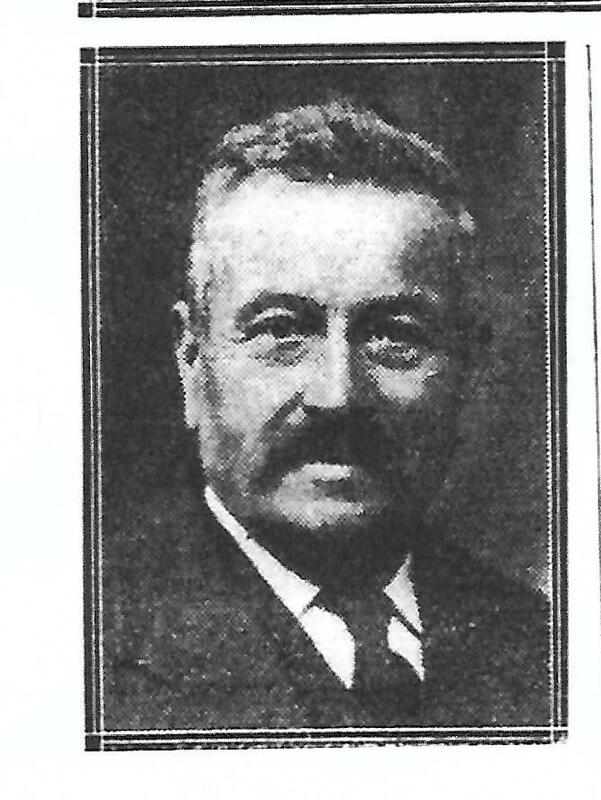 He was also one of the original members of the Leigh Fire Brigade, and was Second Officer for some 40 years. He only resigned about four years ago (1925) when he was made an honorary member. On his resignation he was presented with a case of pipes by the present Chief Officer, Mr Hubert Russell. During the period he served, Mr Faircloth served under the following seven Chief Officers: Messrs Eade, McDonall, Dempster, Hawkins, Randerson, Richards and Russell. In his younger days Harry took a keen interest in cricket and assisted the Leigh Cricket Club for a long period being their regular wicket keeper for 10 years. On one occasion he and his five sons played together in one match for Leigh. His wife was Alice Martin. They had married in 1883 and had eight children Harry, Fred, Frank, George, Cecil, Percy Raymond, Alice, Edith. Of his six sons and two daughters, seven survived him – all his sons saw service in the Great War, but his son Frank was killed at Gaza. Harry was given a fireman’s funeral, which was very impressive. 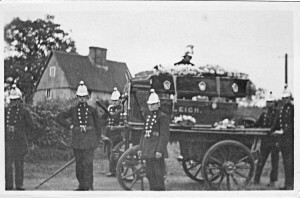 The coffin was placed on the Brigade manual engine and drawn from the house to the bottom of the hill leading to the church by the members of the Leigh Fire Brigade. The cortege was led by Chief Officer H. Russell, followed by Honorary Chief Officer Randerson, who carried the Fire Brigade wreath. The coffin was borne by four members of the Brigade, Messrs. C. Ingram, I. Kneller, E. Butler and E. Jenner and at the church gates the other members of the brigade formed a guard of honour and stood at the salute as the coffin passed. Mrs H Faircloth, widow; Mr and Mrs Harry Faircloth, Mr and Mrs Fred Faircloth, Mr and Mrs George Faircloth, Mr and Mrs Ray Faircloth (sons and daughters in law), Mr C Faircloth, son, Mr and Mrs W Hayter (son-in-law and daughter), Miss Edith Faircloth daughter. Mr. Gordon Thoroughgood, Mr and Mrs Frank Martin (brother-in-law and sister), Mr and Mrs C Parker (brother in-law and sister), Mr and Mrs S Martin, Mr and Mrs R Martin and Mr H Martin. And, in addition, the cortege was followed by a large number of parishioners and the church was full for the service. Their names are listed in the Courier article. A further two honorary members of the Fire Brigade attended with the Brigade, Messrs W Baldwin and A Stubbings. There were many wreaths from family and friends and of course from the Leigh Fire Brigade. The full Courier article of the funeral is in our Archive.